Week 5: Experts in authoritarianism advise to keep a list of things subtly changing around you, so you’ll remember. 1. CIA fears reprisals from Trump over their findings on Russian interference, while his team threatens to bring in new leadership. 2. Trump press conference, scheduled for 12/15 to discuss dealing with his conflicts of interest, was “postponed” indefinitely. 3. WSJ reporter later reveals Trump will not divest of his businesses — excuse given is the price would be a fire sale. 4. Vanity Fair issues a scathing review of Trump Grill. Trump responds with a Twitter attack, saying of VF, “Way down, big trouble, dead!” Same day, VF picks up a record number of subscriptions. 5. Trump team accounts they plan to change the traditional daily WH briefings. 6. Ivanka will be taking a WH office, typically reserved for first ladies. 7. Kellyanne Conway says Trump is looking at way to get around nepotism rules so he can include Ivanka and Jared in his administration. 8. Trump continues to deny Russian hacking of the election. Says it could have been China or a 400 pound man. 11. FBI and CIA and all intel reach agreement that Russia interfered with our election, with a goal of getting Trump elected. 12. The General Services Administration told Trump he would violate his DC hotel lease “the moment he takes office.” Word spreads that Trump will replace the leadership of the GSA. 13. Gen. Michael Flynn, Trump’s pick for national security adviser, was found guilty by the Army of sharing classified information. Flynn also deletes his tweet promoting Pizzagate. 14. Ivanka auctions off a coffee date, with a $50k floor. As rumbling of conflict start to stir, the website posting mysteriously disappears. 15. Trump team asks for a list of climate scientists. Request is denied. Scientists are said to be backing up their data, for fear, it too, will disappear. 16. Trump continues his “Thank You” tour to only states he won. He stands before Christmas trees only — no reference to other religions. 17. Trump issues a negative tweet on Lockheed Martin, just before the market open. Like Boeing, the stock craters. It is discovered that traders are starting to anticipate Trump’s tweets, by taking long or short positions. 18. Trump continues to pick white men for his cabinet — many of whom have no experience with the area they are about to lead. His cabinet is the least diverse since 1989. 19. Trump holds a meetings with tech leaders at Trump Tower, and includes his three children, but excludes the CEO of Twitter for his unwillingness to produce a “Crooked Hillary” emoji. 20. Huma Abedin joins lawyer E. Randol Schoenberg’s calls to release the FBI search warrant that led to the Comey letter. 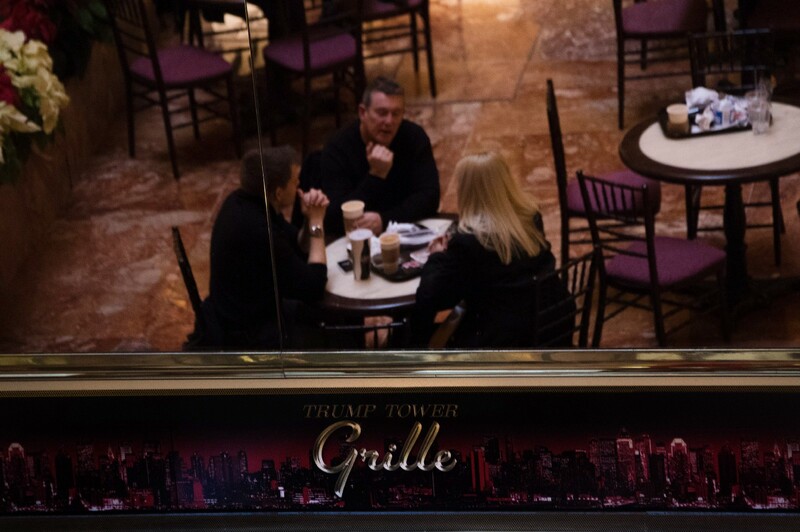 Vanity Fair issues a scathing review of Trump Grill.